They encounter a social worker, Edith Keeler, who helps them find work to pay for the equipment Spock requires to build a tricorder. Unknown to Kirk and Spock, Edith has taken in the recently-arrived and ill McCoy. 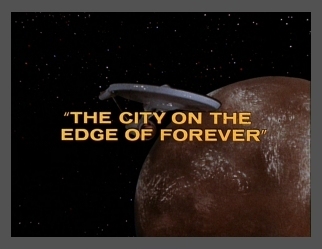 Kirk promptly falls in love with Edith and is devastated when Spock completes his tricorder and discovers that in order to repair history, they must let Edith Keeler be killed in an auto accident. If they allow McCoy to save her as he did before — she will start an effective pacifist movement that will delay the United States' entrance into World War II, thus allowing Hitler's Germany to develop the atomic bomb first and conquer the planet. I enjoy listening to the Guardian's lines. Bart La Rue had a great voice! His voice was used several times in Star Trek. role in one of the episodes? I'll tell you which episode it was. One of the funniest moments of the series!! of the slang of the day. Words Kirk definitely didn't want to hear. and there was NO swearing of any kind on TV.